America has lost the “War on Drugs,” and if you don't think we have, just ask my parents’ dachshund. Her name is Holly, and she’s not even a full dachshund. She’s what cutesy dog breeders call a “Dorky” because she is a cross between a Dachshund and a “Yorkie” (Yorkshire Terrier). My parents don’t even like dogs, but they still have children at home and feel obligated to have dogs for their kids to play with. And picking up dog poop builds character. My parents live near the Rio Grande river, so toads are always making their way into our yard and into Holly’s mouth. Toads have poisonous skin and after biting one Holly will immediately foam at the mouth like a rabid, furry sausage. 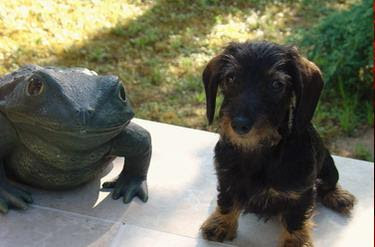 Other dogs have had run-ins with toads, but they usually learn after the first time. Not Holly. As far as we can tell, she seeks out toads and tries to bite them and is foaming at the mouth more often than not. We just assumed Holly was the stupidest dog ever and that her doggie brain was a few sizes too small, but then my mom found an article saying that dogs can get addicted to the hallucinogenic effects of biting toads, no joke! If it gets much worse, we’re going to have to have a puppy intervention, and it won’t be pretty. Parents: Holly, we’ve brought you here tonight to talk about your toad problem. Holly: I don’t have a toad problem. I can quit whenever I want and I'm not hurting anyone. It's my life! So what if I want to go an bite a toad from time to time? Doesn't everyone? Perhaps there is dog rehab. They have salons, spas and resorts for overly moneyed people to take their child-substitute dogs to, so why not doggie rehab? If there isn’t one, I will found the first Canine Drug Rehabilitation facility –which would also treat cats with catnip problems– and become rich beyond my wildest dreams. Since I’ve been paying so much attention to my parents foaming, delinquent puppy lately my wife has accused me of being a “dog lover,” which is just uncalled for. I think she is afraid I’m going to bring a puppy home without asking her, but she should know that I never do anything that might get me in trouble without assessing her reaction first using the Busy Busy Busy Marital Anger Scale. It goes from 1 to 10, with 1 being something I will get forgiven for pretty quickly and 10 being divorce court. For example, I might say, “How mad would you be if I pushed you into this pond/used our savings to buy a killer guitar/quit my job to play Starcraft II full-time?” Then she tells me her number, and I decide if it’s worth it. Wifey doesn’t need to worry because I only like dogs right up to the point where I have to pick up poop.